The move is quite official at this point; BC and I have already eaten two pizzas and all my strutting shoes are packed so that has to count for something. I fear I look like a boozer. All my belongings carefully wrapped in tequila boxes and tucked into vodka crates. Makes me want a G&T. But, as it's only 11 am, I think I'll have another cup of Irish breakfast tea with a splash of milk and a dash of sugar in one of the [only two] mugs still unpacked. 1. Where in my new home can I set up a little vignette with loads of gourds like this (found here, from Miss Nancy McKay)? 2. How on earth will I store my, eh hem, clothing collection? As a point of quirkiness, the house has one small closet. Period. I'm looking at wardrobes, but to be honest, I'll need a few. Any suggestions? 3. What color should I paint? I JUST painted our apartment in the warmest, wombiest (yeah, not a real word) pale camel shade - Boston Tea Party to be exact - and I've been given carte blanc to wield a roller in the new home. 4. Where can I find these little side tables (found here)? I want them ALL but especially that little turquoise number - I know, surprise surprise! 5. Can I justify purchasing this fabulous, scrumptious cowl or this beanie I've been lusting after for the last year? After all it will be considerably colder (and a touch snowier) out East and up the mountainside and a gal needs knits! 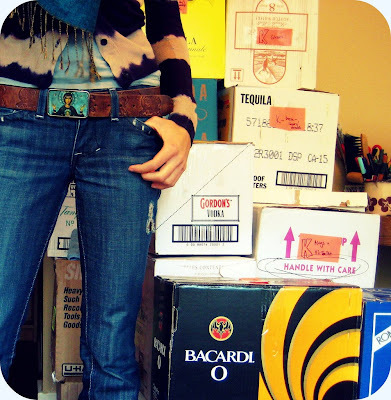 : ) I was just thinking what you said...the boxes of booz HA HA. How fun must it be to be planning, colors, things, arrangements, etc etc etc. One by one they will all happen as you see the end in the beginning. And I think you must continue lusting over the cowl, the knits...this year especially will be much cooler. That beautiful Nancy McKay finds the most beautiful, doesn't she? My goodness! It seems like everyone is moving...If you're going east, I vote for the cowl scarf..I think the mauve colour and style would really suit you. On the other hand, if anyone can "pull off" the beanie, I'm sure you can. Those little cloverleaf tables are very cute. I like the rattan look at the top. Best wishes on your move and your re-decorating. 1. Good luck with your move! 3. Your booze boxes make me laugh because that is exactly how my last move went! 4. WHERE did your belt buckle in the first picture come from??? Oh you ladies are right! I really need that cowl! 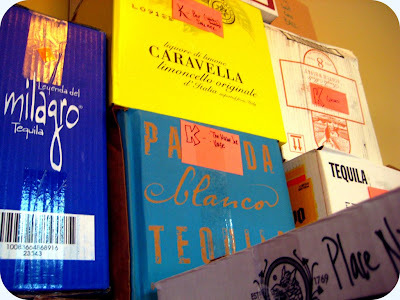 On the booze front, I'm heading back up to the liquor store for more boxes today - any requests? 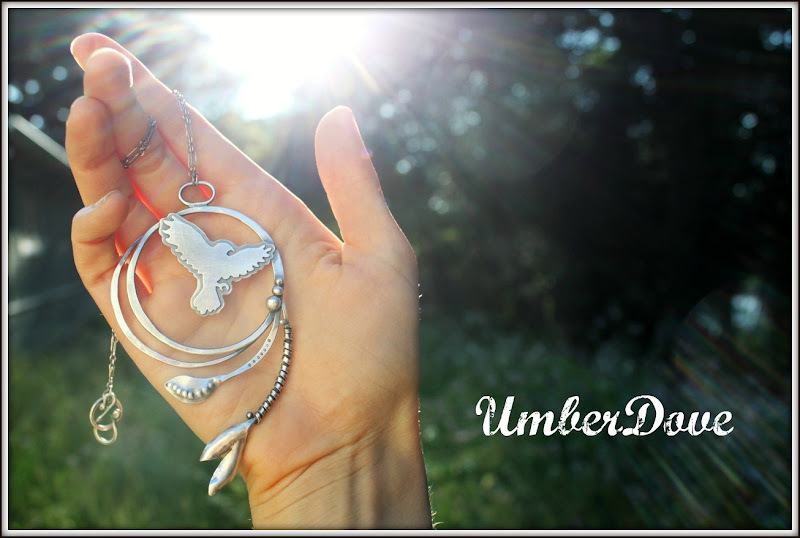 best of luck to you, dear umber. ONE (i beg of you who is moving into a 1920's sweet jesus Craftsman) word 4 yoU...i have...& here IT is: PHOTOS! I love reading your posts - they are hysterically funny, and entertaining in so many ways! Those tables rock by the way... I think any colour would be fine for me - he he, and well, wardrobes? wish I could offer some advice.... my clothes are so packed in, it takes me ages to pry something out. Anything will do usually. first out, first on! I am sure I have things in there that I haven't seen for years? ha ha ha. Good luck with the move! sounds sooooo exciting!